The name's Jill, Dr. Corey, and I'm an administrator at the hospital. Where you work. But you've never noticed me. Not once. After all the times I've stood up for you and your daughter (hic), you've continued to ignore me. But by Grabthar's hammer, you're going to notice me tonight! Adrian may feel calm and happy, but Jill is still looking for that strange buzzy feeling, which she hopes to find in a second Long Island Iced Tea. After all, she's got two hands. It would be a shame for one not to have a drink in it. A father and daughter marrying their significant others in one event? It sounds awesome! I mean, just saying such an awkward sentence makes everything else in the world seem intelligent and glorious. If only Jill would approve. I think all Jeff was trying to propose was that they see other people. Another desperate, failed attempt to escape the grasp of the puppet master. 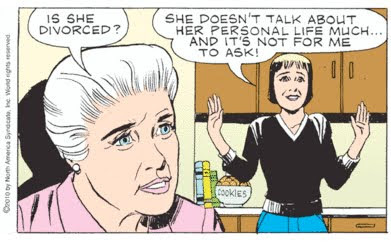 To quote Mary Worth: "!" In fact, I'll even go so far as to say, "! !" 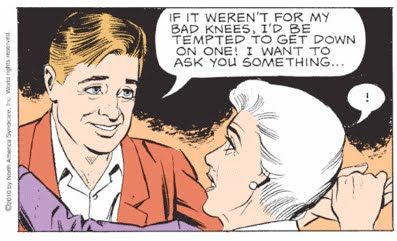 Nothing will delight me more than a watching Mary Worth and Jeff Corey dance for the next few weeks. I am not a huge fan of the dancing shows on television, "Dancing With the Stars," "So You Think You Can Dance," and the like. Basically, I don't think TV does justice to the art form. You lose so much of the beauty and immediacy of dance through the medium of television. But a comic strip? I can't think of a better venue for watching two old people practice dancing. My knees? Well, the right one is fine, but ever since my bumbling daughter amputated my left leg, I've got a ghost itch that is driving me crazy. I don't know if it counts for anything, but it certainly Accounts for a lot. I imagine it started with Jill approving all of Adrian's absences when she realized the hospital was better off the less Adrian was around. I love when people use the phrase "with all due respect" to mean "you do not deserve my respect, so I'm going to say this now." 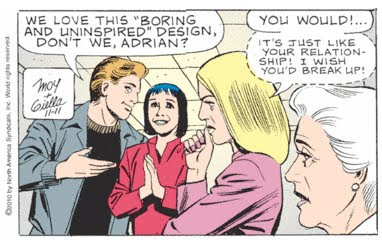 And Mary Worth would be right to say it because Adrian is a moron. 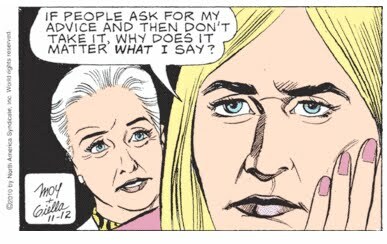 It's like her only defining character trait is that she's absolutely incapable of judging a person's character. Mary needs to dump that left over pasta on Adrian's head. It might wake her up, and at the very least it will cover that horrible case of ringworm on her scalp. 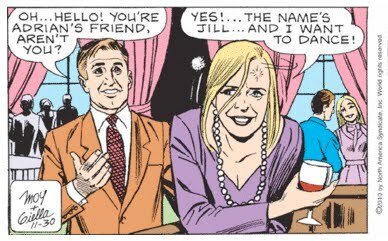 I pity the man that ever went through divorce proceedings with Jill. Husband: Honey, I want a divorce. Husband: I want full custody of the children. Husband: Just sign the papers. Jill (sarcastic): Ha Ha Ha Ha. Negative? Jill's been negative? I hadn't noticed. I did notice that she tried to choose the dress. I did notice that she tried to choose the invitations. I did notice that she tried to break up Adrian and Scott. 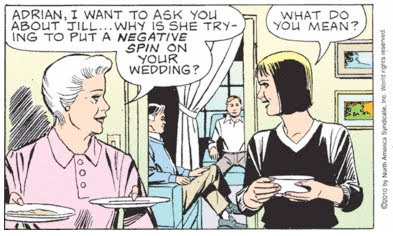 But I hadn't really noticed a negative 'spin.' 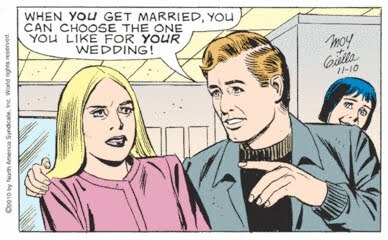 I just assume, come the wedding day, it will be Jill walking down the aisle with Adrian's dad who will give her away, and Jill just wants to make sure everything is ready for the big day. Is that so negative? A few weeks? Your boring and uninspired wedding announcements aren't even back from the printer yet. 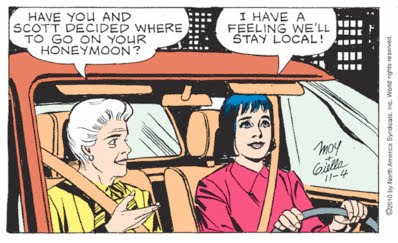 You two are way behind schedule. Plus, Adrian needs to dye her hair again. Her blond roots are showing. 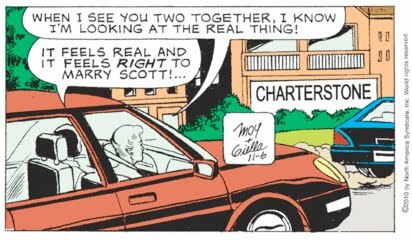 I think Mary Worth just found her new pupil. 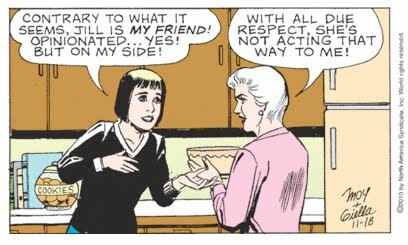 Over the coming months, Mary will mentor Jill in the finer subtleties of meddling. Jill will transform from whiny criticizer to evil persuader, able to instill her will on any victim. But will the transformation be soon enough to make sure Adrian doesn't look like a joke when she walks down the aisle? Thank heaven for hospital administrators like Jill Black, who feels so passionately about keeping things exciting and inspired that she's willing to use one of her three wishes to destroy any vestige of happiness to which these two losers cling. Score! I'm so glad Adrian brought a man along to put Jill in her place! Of course, Jill is going to go home now and kill herself since Scott has obviously opened the wound that cannot heal. Speaking of wounds that cannot heal, that bullet that grazed Scott's head has left a nasty, hairless scar. 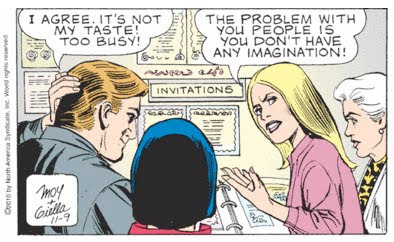 No, Scott doesn't like anything that is too busy. That's why he's marrying Adrian. I'm convinced that Adrian is just bringing Jill along for the laughs. "Scott, you have to be there. Jill is hilarious. It's like her brain has no filters. 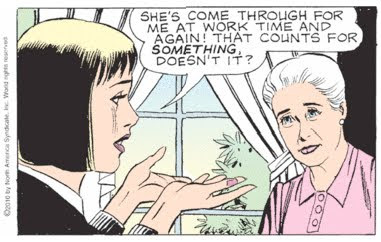 And she gets Mary Worth all worked up, so it's twice the fun!" The stationary store's interior design is as low-key as their cards. 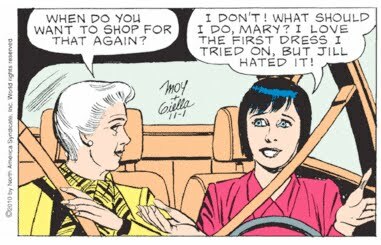 I'm sorry, I really shouldn't blog about things I don't understand, and today is just one more proof that I really don't understand "Mary Worth." 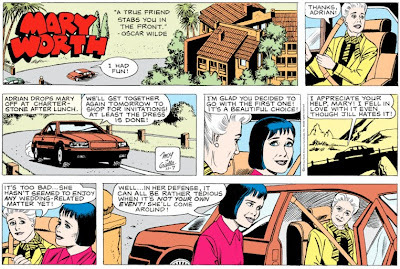 Adrian pulls into Charterstone to drop off Mary, and then proceeds to drive over a mountain before getting to Mary's parking lot. Charterstone is much bigger than I thought. The comic above is much bigger than you think as well. Click on it for the full image. If you dare. Ah, the traditional Santa Royale honeymoon. A classic destination for lovers of all genres. 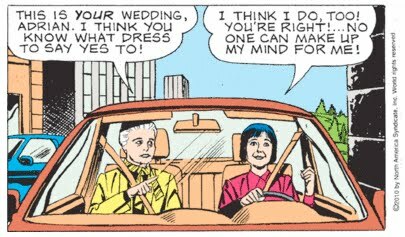 Dagwood and Blondie. Elly and John Patterson, the parents in For Better or For Worse. I think even Fred and Wilma Flintstone honeymooned there in 10,000 B.C. 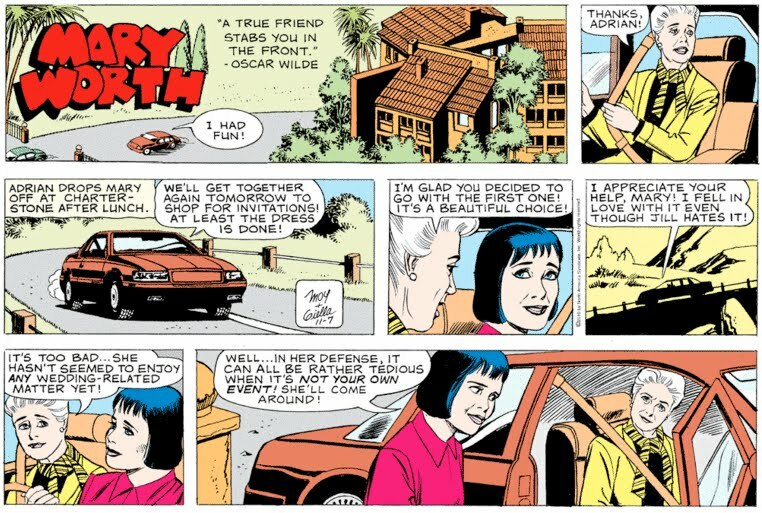 It's amazing how masterfully Mary Worth has convinced Adrian that she's making up her own mind. In the meddling game, we call this the "Double Dip." The government says I must pay taxes. I don't know what to do. The air is polluted. Should I breathe it? I'm wearing my seat belt. Do I have to crash my car? I want to thank everyone for continuing to read this blog. It's easier to be open about my love for Mary Worth when I know others share my disease. If you're new to Mary Worth & Me, don't forget to read your secret messages by holding your cursor over each image. And if you're new to this strip, stop reading it now, while you still can.